CO2 Stability Short Term Drift: Drift over four hours shall not exceed 0.8 mm Hg max. Operator selectable O2, N2O, HE and Agent compensation. Calibration No routine user calibration required. Sample Cell Detection Insertion automatically turns sampling pump on. Removal automatically turns sampling pump off. Regulatory Designed to meet IEC 60601-1-2, EN55011 – CISPIR 11 Class B (Radiated and Conductive Emissions), IEC 61000-4-2 Electrostatic Discharge Immunity, IEC 61000-4-3 Radiated Immunity,Designed to comply with 93/42/EEC (MDD CE Marking), FDA Standards, ASTM F1456-01 Minimum Performance and Safety Requirements for Capnometers and IEC80601-2-55:2011. Medical Electrical Equipment performance requirements for the basic safety and essential performance of respiratory gas monitors. Calibration No routine user calibration required. An airway adapter zero is required when changing to a different style of airway adapter. Voltage Requirements +5.0 VDC, 1.125 W Typical, 1.5 W Maximum. Regulatory Designed to meet IEC 60601-1-2, EN55011 – CISPIR 11 Class B (Radiated and Conductive Emissions), IEC 61000-4-2 Electrostatic Discharge Immunity, IEC 61000-4-3 Radiated Immunity, Designed to comply with 93/42/EEC (MDD CE Marking), FDA Standards, ASTM F1456-01 Minimum Performance and Safety Requirements for Capnometers and IEC 80601-2-55:2011. 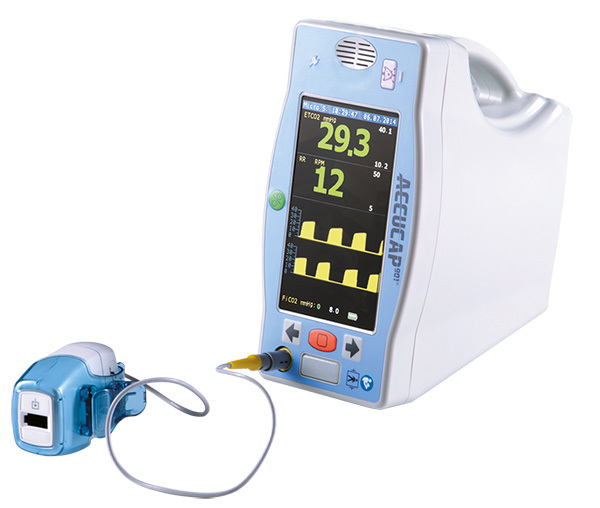 Medical Electrical Equipment performance requirements for the basic safety and essential performance of respiratory gas monitors. If You Have Any Question About ACCUCAP910 Please Ask Us.